Can Emerald, Diamond and Cats Eye be worn together? We are all aware of the powerful impact of the nine planets on our lives. What is important to evaluate is that are there certain combinations in the chart that are remarkable and can these combinations be unlocked to give powerful and potent results. The beauty of Gem Therapy lies in an accurate analysis of debilitating factors and good combinations in the horoscope and making use of effective gemstones to bring in the desired results. Venus: Venus is the great preceptor and represents pure, pristine and unbiased White Knowledge. Venus is beauty and creativity. It helps the individual to be rational, truthful, apply and test the knowledge and implement the same without prejudice. The Gemstones for Venus are White Sapphire and Diamond. Ketu: The dervish/ mendicant is the planet that signifies Moksha/ Liberation, freedom from pain and negative thoughts and give the strength and courage to perform intense spiritual practices and stock to rigorous spiritual regimens. Ketu is the planet that is a key factor in inner awakening. It also gives occult powers. The Gemstone of Ketu is Cat’s eye Chrysoberyl. These three Gemstones also provide protection. People involved in alternative healing practices such as Pranic Healing, meditation, Yogic Healing, Astrology, Mantra chanting, Tarot reading, Psychics etc find the energies of these planets aiding their skills. How to unlock the potential of these planets? In Ascendants ruled by Mercury- Virgo and Gemini where these three planets are conjunct, aspecting and located in key houses. In Ascendants ruled by Venus- Taurus and Libra where these three planets are conjunct, aspecting and located in key houses. Operation of Dasha or Antardasha (Planetary periods) Where harnessing the energies of these planets be useful! If these planets influence key houses like 1, 9th, 10th or 5th. Many other gemstones also have healing powers but this is a unique combination and it can be leveraged using Gem Therapy. These Gemstones bless one with intuition, decision making abilities and a magnetic personality. Featured today is a magnetic talisman. Brilliant deep green emerald with excellent clarity. 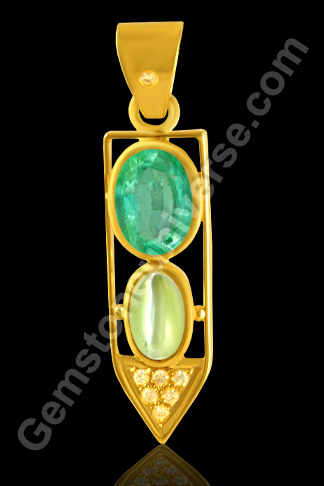 Hypnotizing and exiting at the same time is the Cat’s eye Chrysoberyl gemstone as the centre piece. Majestic and moving dynamic chatoyant band. At the pinnacle are glittering pure untreated white Diamonds representing the pristine knowledge given by Venus! View the video to experience what exactly are Jyotish Gemstones.To view this Emerald Gemstone before it was set please click here. To view this Cats Eye Gemstone before it was set please click here.